The Disney Planes Turbo Launcher pack contains 1 x hand held power launcher and one exclusive Disney Plane, plus stickers for the Turbo Launcher. The Turbo Launcher also features a target sight to help you fly your Disney Planes. 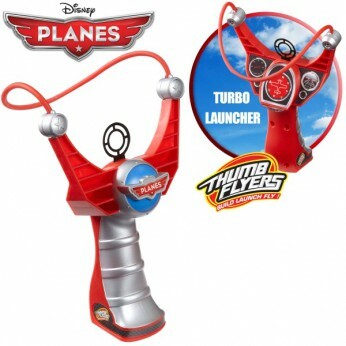 The Turbo Launcher can be used with all your Disney Planes Thumb Flyers collection. For ages 4+…. This toy costs approximately £6.99 (for the latest and best prices make sure you check our retailer list for the Planes Turbo Power Launcher above). In our review of Planes Turbo Power Launcher we classed it as being suitable for ages 3 years, 4 years, 5 years but recommend you check the manufacturer specific advice before purchasing.